A. K. Bobby Mallik D. M. D.
Most of the time, root canal therapy is effective at permanently relieving tooth pain and halting infection of the soft tissues deep inside the teeth and gums. But occasionally, as in any medical procedure, the body may not heal as we expect it to. After a period of time, you may experience pain in the affected tooth again — or, even if you have no symptoms, x-rays may reveal that infection is still present near the tooth's roots. In that case, we may recommend that you have root canal retreatment. If we find that initial root canal (endodontic) therapy has failed, the first thing we will do is evaluate your options and discuss them with you. 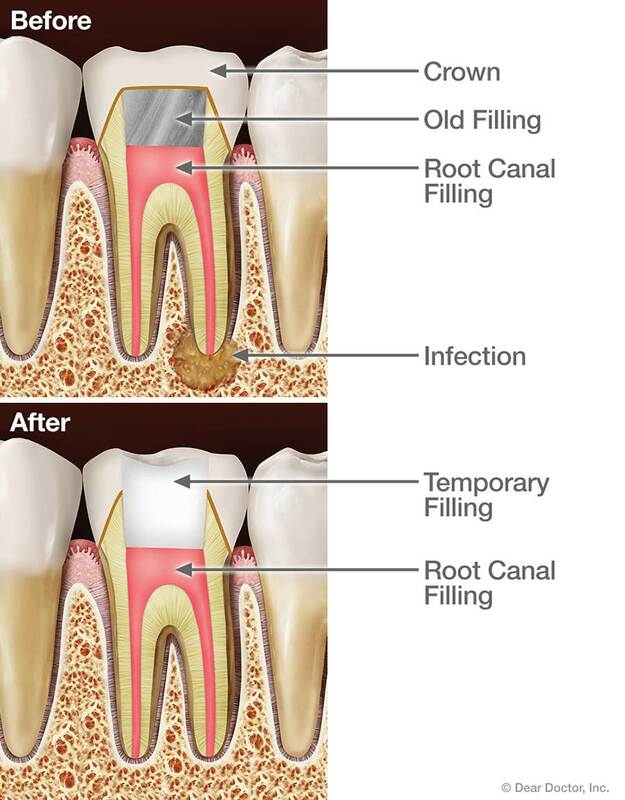 Besides retreatment, the alternatives may include endodontic surgery or extraction (removal) of the tooth. However, a missing tooth should be replaced by a dental implant, a bridge or a partial denture as soon as possible — and none of these are simple or inexpensive options. That's part of the reason we prefer to help you retain your natural teeth whenever possible. If endodontic retreatment is appropriate for you, the procedure we perform in our office is similar to a routine root canal, with a few added measures. After you are anesthetized (usually with a numbing shot), any restorations presently on your tooth — crowns, for example — will be altered to provide access to the root canal filling material. This is usually accomplished by making a small opening into the inner part of the tooth, removing filling material or obstructions, and cleaning the pulp chambers with tiny instruments. We will use a microscope and light to search carefully for additional canals or unusual structures. If the treatment process becomes extremely complex, we may finish the procedure in a subsequent visit. Finally, when we are satisfied that all the canals have been cleaned and disinfected, we will fill them with inert material and seal them up, and then place a temporary filling in the tooth. A permanent restoration will need to be placed at a later time. Medicine and dentistry are as much art as science, and neither one can guarantee that any procedure will be 100% successful. While endodontic retreatment can be more complex than initial root canal therapy, it offers a good chance of success in many instances. As specialists in endodontic procedures, we routinely use our technical training and clinical experience to resolve challenging root canal problems. And, since the field of endodontics is constantly evolving, it's possible that we may be able to use new techniques that weren't available when your first root canal procedure was done. We take seriously our responsibility to help you understand the risks, benefits and alternatives for treating root canal problems. When we recommend retreatment, it's because we feel it is the best way for you to preserve your natural teeth — and we want you to be able to enjoy them for many years to come.